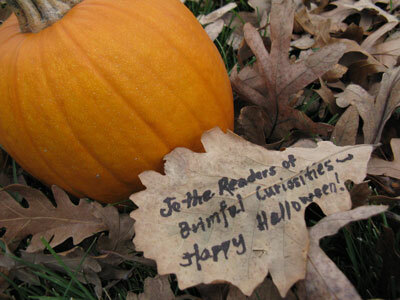 Brimful Curiosities: Happy Halloween from Brimful Curiosities! Halloween leaf message inspired by leaf invitation on page 4 of Mary Pope Osborne's Haunted Castle on Hallows Eve (Magic Tree House #30). 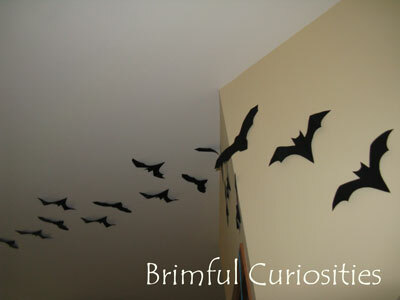 Bats on our ceiling. Idea from Pinterest and Reading Confetti's Handprint Bats post. 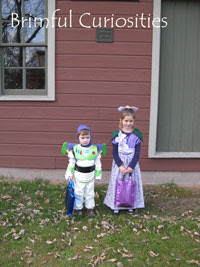 And presenting -- Buzz Lightyear (from Toy Story) and Lady Lilac (from Elsa Beskow's The Flowers' Festival). Trick or Treat! Thanks for the mention! Your bats are great!!!!! Aww! What a great post. Love all of the pics. Thanks for the great website for candy experiments. I really appreciate the link. :) This is why I love blogging- we love to share and get such great ideas from other parents/teachers. Glad to be in this community. Happy Halloween. Cute kiddos! I love the ghost cups. I'll have to remember that one. Hope you had a fun night. So festive! 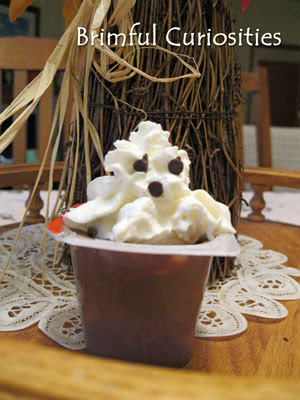 I love all the creative touches, and your little ones are incredibly cute. Hope you had a great night! Great pictures and costumes! Happy Halloween!